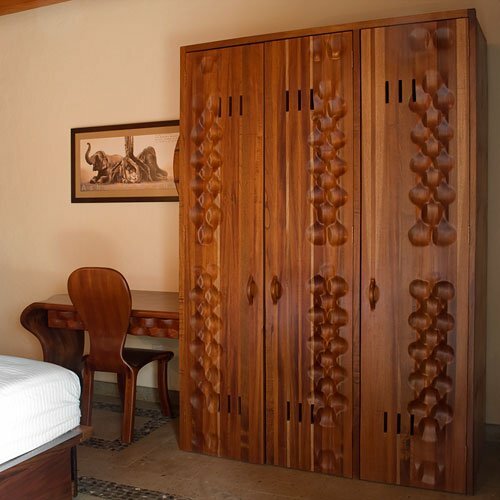 The drawer and closet doors bear the artist’s signature hand-carved wave patterns. The much-coveted spherical shelf swells out of the closet wall right above the desk. The desk itself is a fluid plane that gushes down to the floor in rivulets. This desk and closet is truly a striking piece of furniture. This collection is only a small sample of the hundreds of custom furniture projects by Victor Klassen. Form and function are blended with gorgeous solid wood to create functional works of art made just for you. Interested in your own custom furniture project? Just give us a call and we’ll work with you to create the piece of your dreams. Mixing classic forms with 3 dimensional elements, this door speaks of mystery and romance. Inverted teardrop or hopeful balloon with a message? The handle is carved in a stylistic human form, as if the embedded figure is Glancing toward a future of endless possibilities. 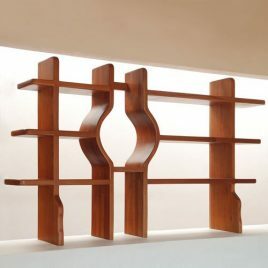 This display shelf, exquisitely beautiful in itself, will serenely defer its viewers’ attention so your beautiful things can be fully appreciated and adored. And your favored art piece will be given its special space, as two vertical beams in the middle curve around it like two palms cupping something delicate and precious. 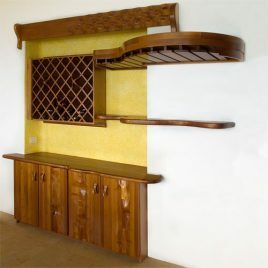 Delight in the fluidity of the wooden wavelets rippling in the top beam and bottom cabinets; in the exquisite lattice pattern of the wine rack in which as many as 50 bottles are cradled; then in the soft twists of the ledge, which are echoed in the wide curve embracing the wooden rack that holds the bar glasses. These floor units make a design showcase out of any kitchen. 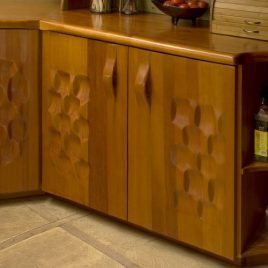 The smooth lustrous wood, the warm earthy stain, the carved handles seamlessly integrated into doors, all contribute to a raw and natural aesthetic, while the sculpted wave details in the cabinetry give it an air of sophistication.